After a month of television reruns and holiday not-so-special programs, I’m excited that tonight season 3 of “Downton Abbey” premiers on PBS in America. I’m a bit of an Anglophile, so I find this series very interesting, well-written and well-acted. Anything with Dame Maggie Smith is worth watching in my book. In honor of tonight’s season premier, I decided to make British scones, which is often considered the quintessential British snack. Most Brits will enjoy a scone paired with afternoon tea. British scones can be sweet or savory, and – as you’ll see in this recipe – are easily made. The secret for making great British scones is to use very cold butter and to work quickly with the dough. Keeping all the ingredients and utensils (including your hands if you rub in the butter by hand) as cool as possible will ensure for a lighter, fluffier scone that rises well. I decided to make two kinds of scones: one with blackberries and a second batch with raspberries. You could just as easily prepare cheese scones by substituting the same amount of shredded cheese for the fruit. Don’t be afraid to be creative – or to use what’s leftover in the refrigerator. © 2013 Baked Chicago. All rights reserved. Preheat your oven to 425° F. Line a baking sheet with parchment paper and set aside. In a large bowl, sift together the flour, cream of tartar, baking soda and salt. Use a pastry blender to quickly cut the butter into the flour mixture, until it resembles fine breadcrumbs. Stir in the sugar and milk. Fold in the chopped fruit. 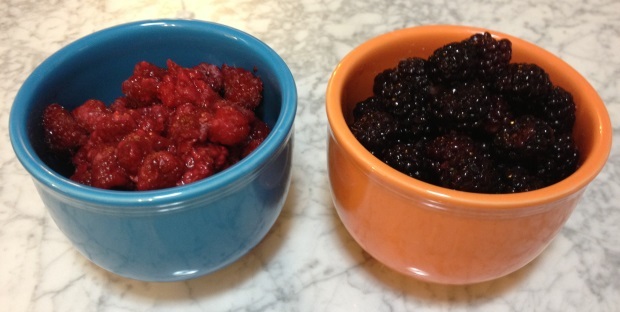 I prefer blackberries or raspberries, but any fruit will work (e.g. cranberries, apples, cherries). The higher the water content of the fruit, the less milk you should use in the dough. When all ingredients are combined, it should be a soft dough. Turn the dough onto a floured work surface. Knead the dough lightly and roll it out to about 3/4-inch thickness. Cut the dough into 2-inch rounds or squares. Place the scones on the prepared baking sheet and brush the tops with the remaining 2 tablespoons of milk to glaze. Bake for 10 minutes, or until golden brown. Cool on a wire rack for a few minutes, then serve warm with butter or jam.